The Nene Valley men's team of, from the left, Sean Beard, Barry Warne, Dave Neal, Chris Hunt and Paul Parkin. It was a case of age before beauty at Long Eaton on Saturday as Nene Valley Harriers Over 45 men secured a top 10 position in the British Masters Cross-Country Relays while their Over 35 ladies finished 14th. Both relay teams did themselves proud in the prestigious national event, especially given that all of their runners were approaching, or even over, the top of the 10-year age bands. The Nene Valley ladies team of, from the left, Yvonne Scarrott, Sophie Wilkinson-Hargate and Nicky Morgan. The course, which measured a fraction under two miles, was flat, but a keen northerly wind and patches of thick mud made for a testing run. The men briefly found themselves in medal contention after Sean Beard’s first leg run of 11:14 was followed by a fine run from Dave Neal, whose time of 10:53 hauled Nene Valley up to fourth place behind Salford, Rotherham and Barnsley. But having used their two star performers early on, the team eventually slipped back to ninth position. The Nene Valley ladies delivered a good display, and Sophie Wilkinson-Hargate’s time of 13:04 was quicker than three of the five athletes in the Nene Valley men’s team. With sterling support from Yvonne Scarrott and Nicky Morgan the Harriers secured a notable 14th-place finish. Over 35 Ladies: Yvonne Scarrott 14:31; Sophie Wilkinson-Hargate 13:04; Nicky Morgan. 13:36. Team 41:11. Sophie Wilkinson-Hargate in action for Nene Valley Harriers at the British Masters Cross-Country Relays. A gusty wind didn’t hamper Ben Heron as he flew to victory in Sunday’s Fenland 10 road race held at Walton Highway near Wisbech. 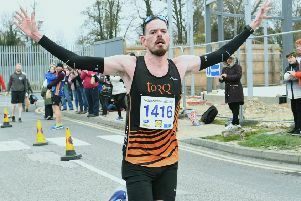 The Peterborough AC star made light work of the fast and flat Fenland circuit, finishing in a time of 54:48. That was 13 seconds clear of runner-up David Hudson of Huntingdon based club BRJ. It was a good day for Peterborough AC, who comfortably won the team prize. James Skinner had a fine run, finishing fourth in 57:03, and with Kirk Brawn eighth and Steve Hall 14th the front of the field was awash with Peterborough AC vests. Rapidly improving Bushfield Jogger Martin Gichuhi ran well, finishing seventh in 58:14 and Werrington Jogger Jeff Lucas came in 16th. Great East Run winner Georgia Schweining won the ladies race with a 57:10 clocking. Only four men finished ahead of the Cambridge and Coleridge athlete as she continued her winning run.